Made some shakshouka last night as an antidote to the huge turkey meal we just had the night before. This version is an amalgamation of several recipes since I discovered shakshouka in a Sunset magazine a couple of years ago. 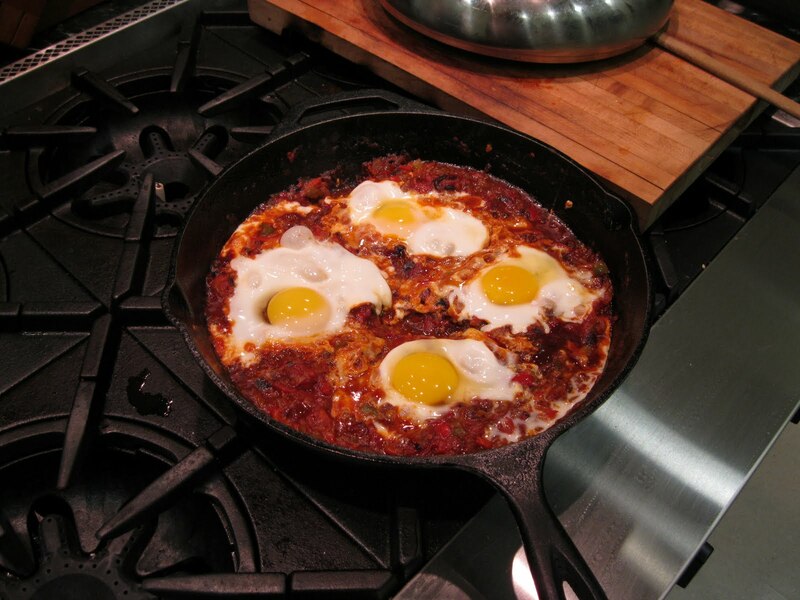 Shakshouka is very popular in Northern Africa, especially Tunisia, and in Israel where there are as many versions as cooks who make it. It's a tomato and pepper-based sauce, usually with Middle Eastern spices, with eggs poached on top. In this version I basically make a tomato sauce with spices and poach the eggs in the finished sauce. 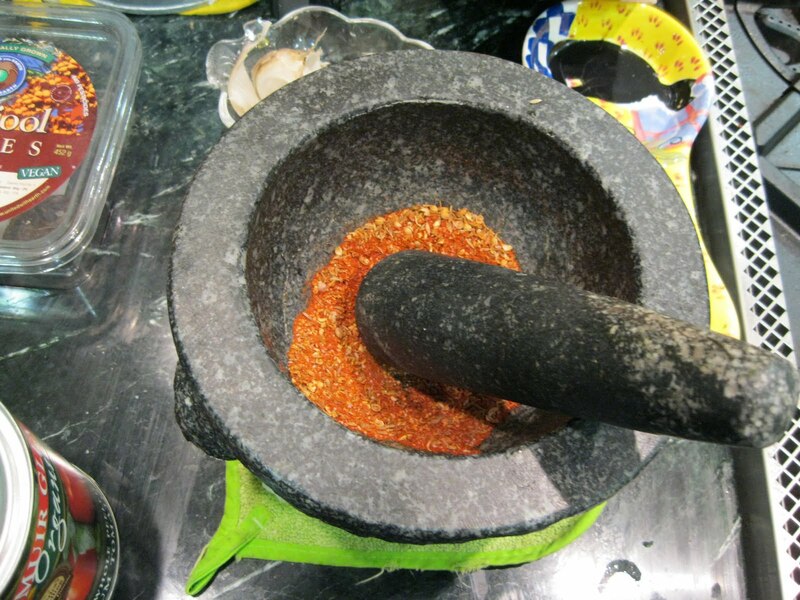 I use my Thai granite mortar and pestle to pound the whole spices with the garlic rather than rely on bottled ground spices whenever possible. The tomatoes are Muir Glen whole tomatoes (when fresh vine-ripened are not available) and I use free-range organic chicken eggs (as I have yet to get my own live egg-laying chickens). Coriander, cumin, salt, and paprika in the mortar pounded almost into a powder. 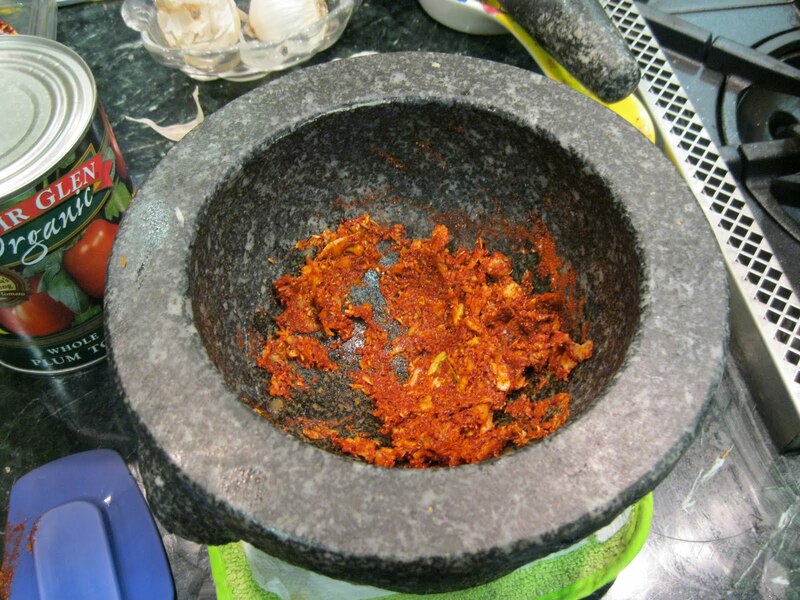 Put the coriander, cumin, salt, and paprika in the mortar and pound it into almost a powder. Then pound the garlic into the ground spices making it somewhat of a paste. 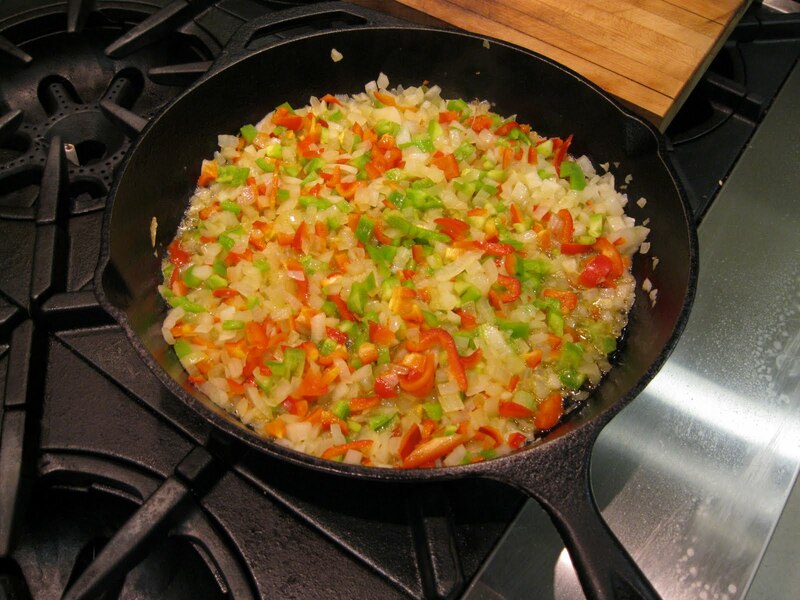 In a large skillet add the olive oil and bring up the heat over a medium flame. When hot add the diced onion and cook until translucent. Add the diced peppers and allow to cook for about 10 minutes or until everything is pretty well softened. Make a clearing in the middle of the pan and add the spice paste allowing it to caramelize for a few minutes making sure not to burn but allowing it to cook a bit. 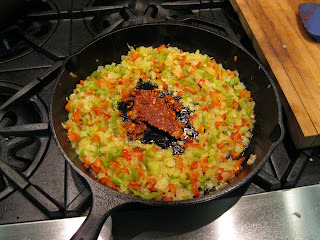 Stir the spice paste into the vegetables and then add the tomato paste, doing the same thing as with the spices, allowing it to caramelize as well. Let the whole thing cook for 1-2 hours over low heat, checking it to make sure it is not burning. You can cover it most of that time in order to preserve the water but if it starts to dry out, put some water into the tomato can and stir in enough of it to reconstitute the sauce, 1/4 or 1/2 cup of water at a time usually works best. 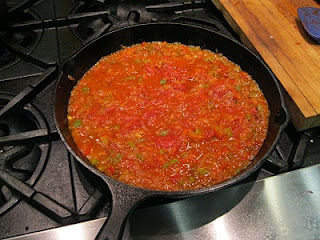 Once the sauce is cooked, it will have lost a fair amount of the original liquid. It's a fine line between reduction and burning which may take a few times to get familiar with. Always make sure to have that water around but you don't want the final sauce to be too watery. Once the sauce is cooked, crack each of the four eggs into the sauce forming a square in the pan, one egg in each corner. The idea is allow the sauce to poach the eggs. Cover the pan and allow them to cook for 4-5 minutes to get a light covering over the yolk without hardening it so that it remains runny when served. Then sprinkle a bit more pimenton over the whole thing. This dish works very well with brown rice with some bread on the side. You may want to drizzle some quality olive oil over the dish too. This is a recipe I tried from Mario Batali after having seen him make it on Good Morning America earlier this week. It was simple sauce of butternut squash with onions. Heat oil at medium heat in large skillet, adding the garlic to almost brown. Add the onion slices and cook until translucent. Add the squash and mix into the onion and oil. This dish takes a while as you want to caramelize the squash and onion over time but not burn them. If you keep an eye on them and stir regularly they should be good in about 20-30 minutes. Meanwhile prepare the pasta, you know, salt in the rapidly boiling water and adding the pasta and all that. As per Mario, I remove while quite al dente and add into the sauce towards the end of the sauce, using some pasta water to keep the sauce somewhat moist. The squash should be really soft kind of falling apart as that is what makes it a good dressing for the pasta. I followed a friend's direction on the raab, peeling the stems first, then parboiling them whole for about 5 minutes. I removed them to a skillet with olive oil, sliced garlic and pepperoncini, stir-frying them for a few minutes until pretty limp. Very nice accompaniment to the pasta dish.